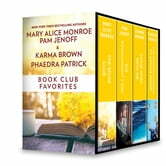 Four exceptional novels together in one box set! For five women, their monthly meeting is a place of sanctuary and community. These women from different walks of life are each embracing the challenge of change in their own circumstances. And as they share their hopes and fears and triumphs, they will hold fast to the true magic of the book club—friendship. In Poland at the outbreak of the Second World War, Emma Bau takes on a new identity and a job as assistant to a high-ranking Nazi official. Urged by the resistance to use her position to access details of the occupation, Emma must compromise her safety—and her marriage vows—in order to help the cause. As the atrocities of war intensify, Emma must make choices that will risk not only her double life, but also the lives of those she loves. Tegan Lawson is consumed by grief and anger after a devastating accident that changes her life in ways she could never have imagined. But then her adoring husband, Gabe, reminds her of their Jar of Spontaneity, a collection of their dream destinations and experiences, and so begins an adventure of a lifetime. Together they explore the world and search for forgiveness, possibly to find hope. Sixty-nine-year-old Arthur Pepper lives a simple, orderly life. But on the one-year anniversary of his wife’s death, he discovers in her possessions a gold charm bracelet that he’d never seen before. Arthur embarks on a life-changing adventure to find the truth about his wife’s life before they met, a journey that leads him to find hope, healing and self-discovery in the most unexpected places.